Crystal comprised of the hexagonal prism, a much flattened pyramid and the pinacoid. 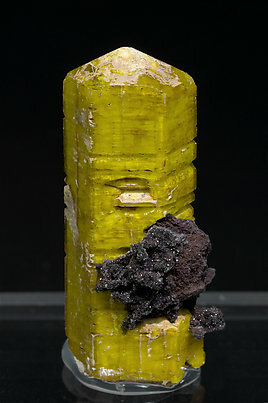 The crystal, with a small matrix of microcrystalline Calcite, is notable for its intense yellow color. As usual when the identification is uncertain we will provide an analysis to the buyer of the specimen. In this case to prove that it is Sturmanite and not Ettringite. The sample is with an autographed label from the Desmond Sacco collection that we'll send to the buyer. Isolated crystals, some of them doubly terminated, comprised of the hexagonal prism, a much flattened dipyramid and the pinacoid. 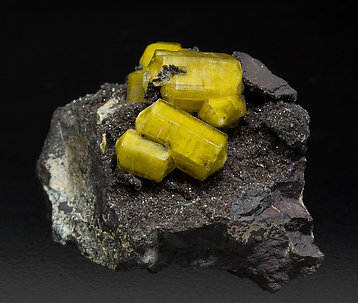 The crystals, implanted on a matrix coated by microcrystalline Calcite, are notable for their intense and bright yellow color. As usual when the identification is uncertain we will provide an analysis to the buyer of the specimen. In this case to prove that it is Sturmanite and not Ettringite.